The River House stands in three acres of mature garden, ten minutes' walk from the centre of Ramsey yet quiet and peaceful. The Sulby River, the longest on the island and tidal, runs alongside the garden and is home to salmon, sea trout and grey mullet. Snaefell is in the distance and the Ramsey nature reserve is just across the river. 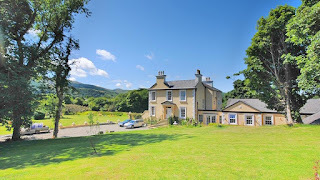 The River House was built around 1820 and was completely renovated by the present owner and furnished with antiques, including the two elegant and comfortable reception rooms which guests may use. The three bedrooms, all with en suite bathrooms, in the main house are spacious, luxuriously appointed and furnished with pretty chintzes and there are lovely views of the river, the nature reserve and Snaefell. 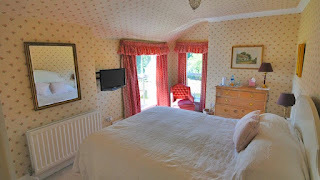 There is also a ground level suite with a large beautifully furnished sitting room and bedroom with adjoining bathroom, both with double French windows opening out onto the river. Room rates include a full English breakfast served in the sunny garden room. Guests may choose cereals, porridge, grapefruit, bacon, sausage, tomato, mushroom, baked beans, hash browns, and eggs cooked as they wish, followed by toast with home made marmalade and jams, and tea or coffee. If asked for in advance, guests may also have Manx kippers or smoked haddock.